They get their name due to their ‘sudden’ appearance at this time of year, but they look as though they have come dressed especially for the occasion wearing a green metallic waistcoat, which is all of a sparkle and glittery! 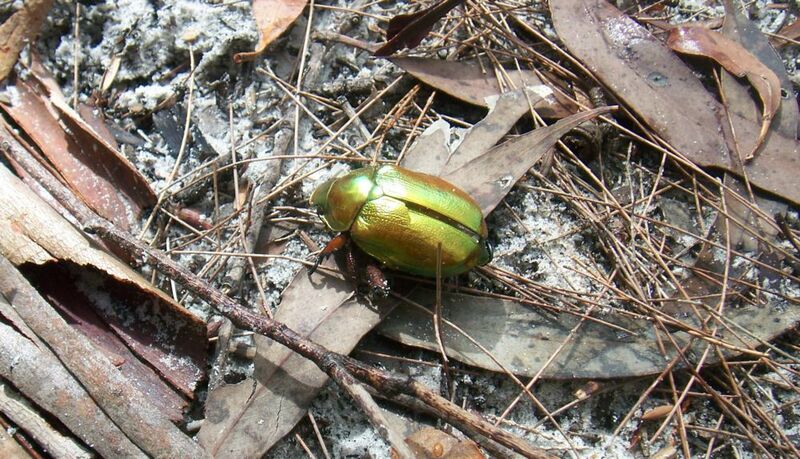 There are 34 species of the Christmas Beetle genus Anoplognathus – The one above was about 35mm long. The larvae is laid in the soil and takes either 12 or 24 months to mature (depending on warmth of winter) before pupating and emerging usually after the onset of the summer rains. They are voracious eaters, making zigzag cuts into the eucalyptus leaves that they feed on, which shreds the leaves with much getting wasted as it falls to the ground. In numbers they can therefore have dire effects on eucalyptus woodlands. This entry was posted in Australia - Animals and tagged australia, australian_wildlife, Australia_travel, Fauna, landscape by Linda. Bookmark the permalink. Here there are the same Beetles with style ‘steampunk’…. it’s buautiful and ‘brrrr’ in one time also.